The Comprehensive Cancer Center is committed to providing the finest in cancer-related services through an integrated system of health and social services. 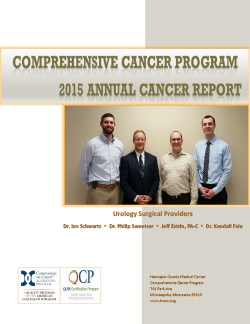 The Cancer Center team includes medical, surgical, and radiation oncologists, specially trained RNs, clinical nurse specialists in complementary therapy, and pharmacists. This team collaborates with physical therapists to provide care to patients with lymphedema and with a geneticist who provides genetic counseling to patients and families. 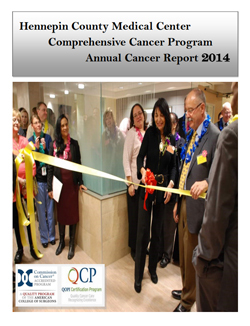 The Comprehensive Cancer Center also includes the Nancy Geltman Shiller Cancer Resource Library. The continuum of care extends from prevention, diagnosis, treatment, symptom control, and cure, through all related aspects of adjustment to relapse, survivorship, and bereavement counseling. Meet one of our Rising Stars! Dr. Bommakanti enjoys building relationships with her patients and contributing to the continuity of care with long term cancer survivors. Working alongside medical trainees and as an Associate Professor of Medicine at the University of Minnesota School of Medicine, she is passionate about medical education. Congratulations to Rising Star, Dr. Bommakanti! Visit the Wanzek Family Breast Care Center for empathetic and expert care, and support. The Hennepin Healthcare Comprehensive Cancer Center works in cooperation with national research groups to advance knowledge about cancer. 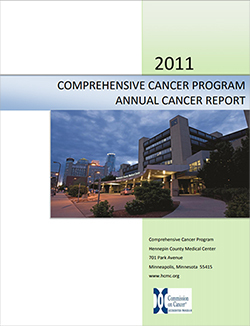 The Center has long-standing partnerships with the Metro Minnesota Community Oncology Research Consortium (MMCORC), a nonprofit research program sponsored by the National Cancer Institute (NCI) and participating community hospitals and clinics, and with the Cancer Trials Support Unit (CTSU). 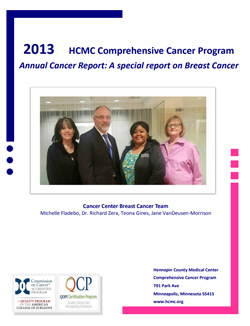 As a result of these affiliations, patients receive access to the newest therapies available for cancer treatment, symptom management, and cancer prevention. As a designated cancer research program of the Minneapolis Medical Research Foundation (MMRF), we work on the treatment and prevention of many types of cancer and cancer symptoms, as well as survivorship. 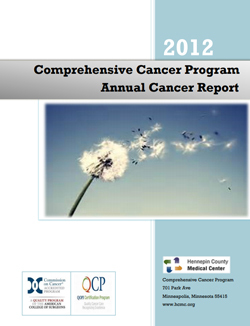 To learn more about our current research program, please visit the MMCORC website at www.ccopnet.com. Click on a cover thumbnail to view the full report.